The gift guide for her is finally here, perfectly timed for all of you last minute male shoppers and packed full of ideas for presents you can buy for any lady in your life, whether it's your girlfriend, sister, mother, daughter, or anyone in between, I've got you sorted. I always get most excited about putting this guide together, as the products are usually the ones that I would most like to find under the tree myself on Christmas day. Perfume is always going to be an obvious, but well received gift idea for a woman of any age, and is definitely a good place to start when buying presents for a girlfriend, sister, mother or friend. Choosing which one is where it becomes difficult... I have to say that the Ted Baker Perfumes are some of my favourites available this year. They are packaged beautifully, look really expensive and smell incredible; 'Polly' is my personal favourite with notes including peach, amber, vanilla and white musk, or you can try 'Ella' with notes of bergamot, jasmine, rose, amber and sandalwood. There are also a lot of gift set options each Christmas, where you can get a good deal on matching perfumes and body products. With the shops full of perfume gift sets, they make a really great present for a girl or woman of any age, thanks to the versatility in the products available. For someone younger, the Ariana Grande Gift Set will make a lovely, big present, containing her perfume and body wash and for someone older, I love the Yardley Fragrance Mist Collection - This is a brand which always goes down well with my Gran. If you're not so sure on what scents she likes to wear, why not go for scented candles... Yankee are my go-to brand, and with their gorgeous Christmas and festive scents and gift sets, you really can't go wrong. Buying makeup as a present can go one of two ways, you can either get it right, or completely wrong. This year Next have created some really great sets of complimenting items and colours that make makeup gifting easy and foolproof - So for the guys shopping for their girls, this could be a real life saver. 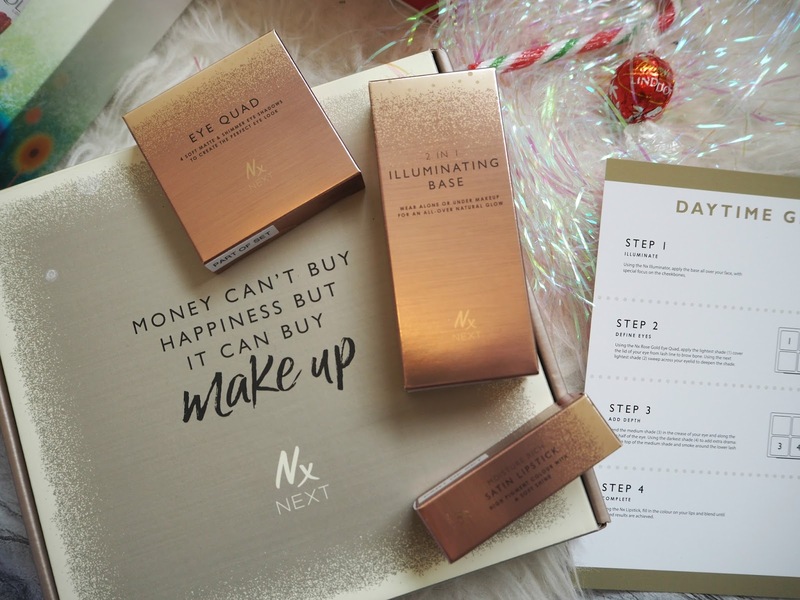 The Daytime Glow set is my favourite, which includes a 2 In 1 Illuminating Base, Eye Quad and a lipstick, all packaged beautifully in a gift box. The latest, and one of the most beautiful Urban Decay eye palettes; 'Heavy Metals' is going to be on so many wishlists this year, so if you want to get something makeup related as a gift, and are feeling confident that you know the recipient likes colour, then this could be a really great way to start. The palette is stunning, with some gorgeous bright and shimmery shades, perfect for Christmas, New Year and any other occasion that calls for a bold eye look. If you're not so sure about what colours and shades to buy, a makeup accessory could be a good place to start, and the Studio Makeup Mirror is a great gift idea. A light up cosmetic mirror is one of those items that every woman needs in her life, but most actually don't have... If you buy this for anyone, you'll definitely be in their good books! 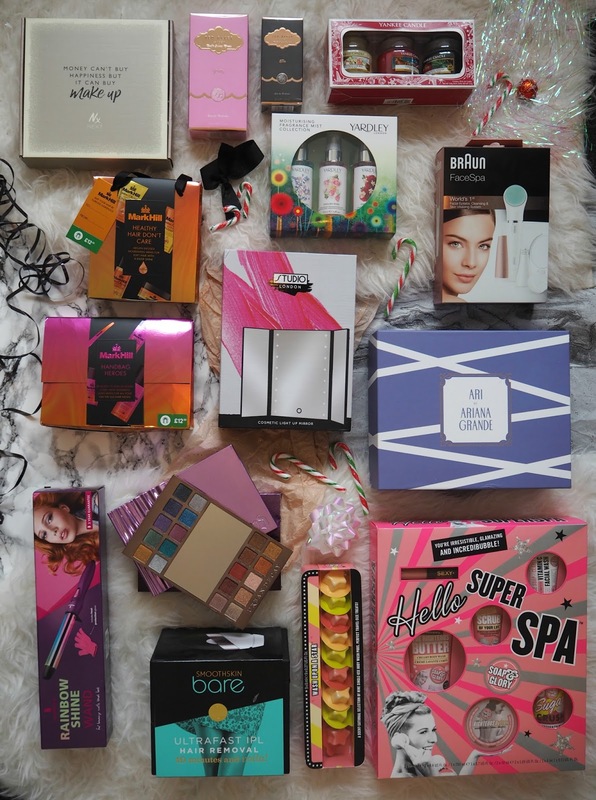 Everyone loves receiving some Soap & Glory products at Christmas time, and as always they have really impressed with their gift sets this year. With prices ranging from the super affordable, to the real treats, there is something to suit every budget and to match everyone's taste with mixtures of bath products and cosmetics. They're all 3 for 2 in Boots too, so it's perfect if you want to buy presents and get yourself a little treat too, because let's face it, who doesn't love S&G?! Also in Boots are some gorgeous sets of products from Mark Hill... With mini hair products in sets to match different hair types, there is something for everyone and they're all packaged in stunning metallic boxes. You can match these on the 3 for 2 offer too! Speaking of hair products, why not treat her to something from the Lee Stafford Rainbow Hair Tools range? Not only do they look amazing (the colours are just gorgeous), but the tools are all really affordable and of amazing quality. I use my curling wand all the time to create really quick, textured curls in the bottom of my hair - It's so easy and completely changes up my hair - Such a lovely present for anyone to receive. 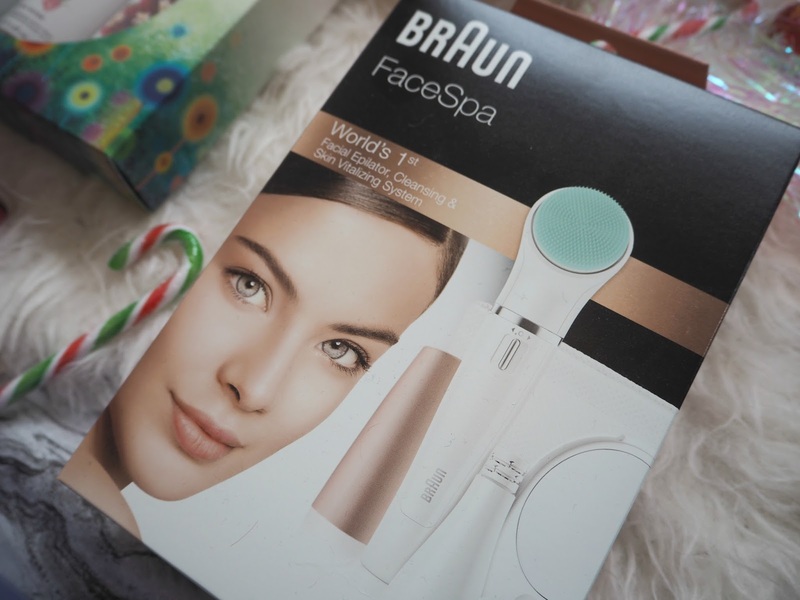 Another electrical product I would highly recommend is the Braun FaceSpa. This is a multi functioning tool which epilates, cleanses and works to vitalize the skin too, all really simply with the change of the head. Unlike the majority of items like this, it's really compact, and the lid is rose gold - always a bonus! It's a really versatile gift that would be useful to a woman of any age. I also think the Smoothskin bare is also a great electrical gift option. This is an IPL hair removal system that painlessly removes any unwanted hair, and with repeat use can eliminate hair growth altogether - The dream! 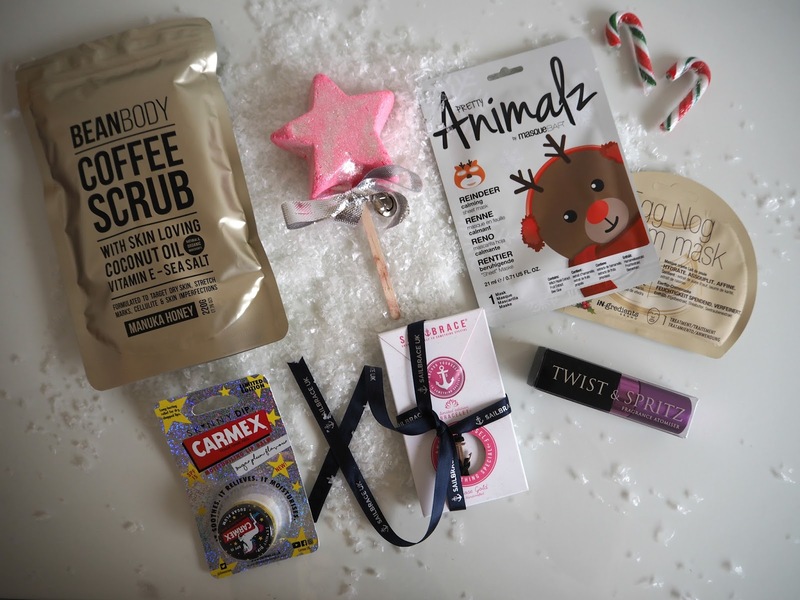 Every girl loves a stocking filler, especially when they're beauty related, so why not make her a stocking full of beauty products. I'm thinking smellies, bath treats and little makeup bits... You really can't go wrong! It's a great way to build up a gift and stick exactly to your own budget, no matter how big or small it is. Something I've grown to love this year is a good coffee scrub, and the BeanBody scrub has been my favourite so far. They have recently released the Manuka Honey version and packaged it in gold for Christmas - such a good stocking filler! Carmex lip balms are a necessity for everyone, so their limited edition Unicorn pot is perfect for popping into the stocking, as is the Twist & Spritz perfume atomiser... It's little things like this which come in so useful and are always so well received... Team this with her favourite perfume for the perfect gift! A real must have pressie for Christmas is a Lush product or two... I always love the Christmas range and try to stock up as much as I can to last me throughout the year. My product of choice this time around has to be the Magic Wand Bubble Bar. Not only does it look good, but it smells incredible and it's reusable - The perfect addition to the Christmas night bath time! I also love to treat myself to a face mask when I relax on Christmas night, and the Masque bar festive masks are just perfect! I love the reindeer design one, it's such fun and the egg nog scented one literally smells good enough to eat! And finally, a little jewellery is always well received, I love the Sailbrace bracelets. They're so cute and quirky, come in lots of different colour options and are packaged so nicely - You can even get his and her's matching pieces, so they're perfect for a couples gift. And that concludes this years gift guides. I do hope that I've been some help and have provided some inspiration this year. Good luck if you still have shopping to do... We're finishing ours tomorrow and then we'll be fully embracing some time off with lots of good food!